Gondola shelving, also commonly referred to as “retail shelving”, is an excellent choice when you have a large amount of merchandise to display on a budget. Perfectly suited for storefront settings, a gondola shelving setup makes excellent use of a wide open space and sections off that space into easier areas for customers to browse through product. 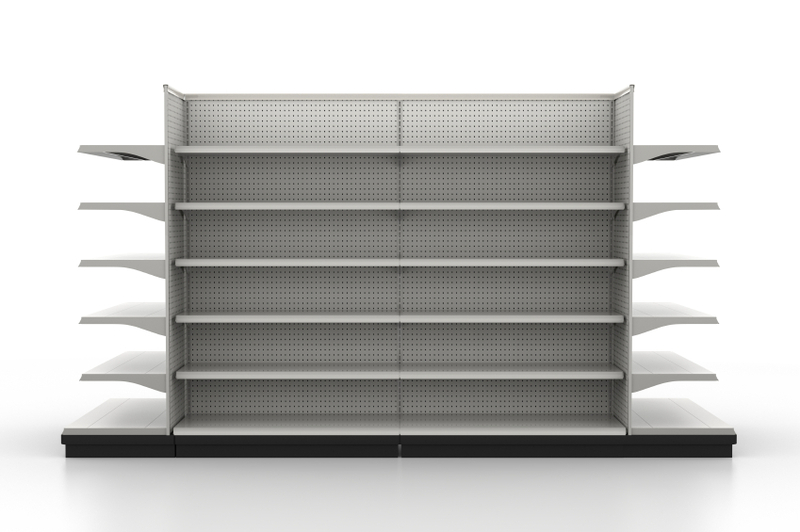 A setup that is strong enough to hold a large number of items, gondola shelving is a popular choice for large retailers, grocery stores, book stores, and drug stores. The image that comes to mind when we think of gondola shelving is the typical cantilever style shelving we’ve all seen at our local retail, corner store. As accurate as this may be it leads one to think that this shelving is rather simplistic in nature, when in reality this couldn’t be further from the truth. The fact is, gondola shelving, due to the wide choice of materials, colors, and numerous options, can be one of the most versatile shelving systems on the market today. Not only must this shelving directly tie in to the aesthetics of the store decor, it must also be configured to a previously conceived layout where all merchandise has a specific location and therefore, a position of where and how the merchandise shall be positioned. Typical gondola shelving consists of islands and half islands and will have backing made of either masonite, melamine, slat wall, or steel panel. Heights, widths, and depths of the islands are completely arbitrary but are normally available in two inch increments. Shelves are available with a number of optional front edges to enhance appearance with the most common front edge design built to hold retail pricing labels. Other design enhancements can be either half radius shelves or even curved islands.